The old site design was starting to feel creaky. HD video is becoming more common online and I wanted a new template that allowed me to post HD from YouTube and Vimeo without needing to sample them down to fit the column width. So thus the new look. I tinkered with the design some, but I'm still not 100% settled. Heck, I'm not even 80% settled. Still I probably won't spend a ton of time customizing it. I figure at this point the blog is what it is and most folks probably come to the blog via a feeder of some sort, so the layout and graphics are not as big an issue as they once were. In other house cleaning news, I've taken down some of my older obsolete links. The link to my animation examples has been removed since every bit of animation in that gallery was at least 5 years old, most of it much older. I will probably utilize YouTube or Vimeo more for stuff like that. We'll see. Short film links are removed as well because not a one of those is less than 10 years old and it's kinda pathetic to keep the links up I think. I seriously need to actually finish one of these 4 or 5 shorts I have in various stages of development. Maybe this year? Again, we'll see. Also I took down the FAQ's regarding my VTS subscription and APT training programs since those are pretty much in retirement now. 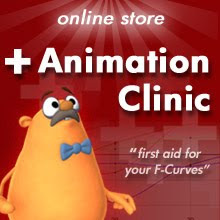 Folks can still get older VTS videos from my AnimationClinic.com store (at a pretty good price, too), but I stopped making new VTS videos in summer of 2009. As for the APT, I have put that into retirement as well. With work and family it was just too hard to put in the proper time to teach the students the way they deserved to be taught. Another factor is that online animation schools have launched and it feels like that market is getting a bit saturated. Rather than expand the APT to remain relevant in the space I decided that it was time to move on. So with those facts in mind I figured I ought to take down the FAQ pages related to them. I may start up training efforts again in the future, but if I do I'd like it to be done differently than what's been done the last 6 years or so online. No idea what that would be, though. Not really worried about it, either. It's good to hear your resolutions and intentions on moving forward. As a teacher and student, I'd be curious to hear what you feel is important in mentoring/training of students/classes, especially in light of your experiences these past 6 years. Best wishes to you! Feel a little sad that APT will be gone, enjoyed it lots. Congratulations with the past roads traveled, with knowledge spread. What about a garage type project short but CGI short like what Don Bluth Does? Dunno.. just a thought right now..
Avi- Thanks for the love. As for what's important, I really think a true mentoring relationship is best. By their nature online schools suffer from a lack of presence and a mandate to be profitable. Thus exposure to experience & leadership is metered, parceled out in small chunks and rather limited. It's only sniffing at the edges of a real mentoring situation. Real mentoring requires presence, time and space and freedom to fail, learn and grow. Mentoring in the classical sense requires the student to really just imitate, copy and learn everything from the ground up- from creative choices to work flow. Problem is that's a TON of work. It's very hard to do with a full time job, and even harder when you put in the gaps that the internet insert in presence. HermanG -- I've thought about doing a short, but production is a different kind of thing than learning/teaching. And it's also a TON of work, which is one of the reasons I decided to stop the APT. :) yes it is..."a TON of work". Funny VTS story, I converted some of them over to play on PS3 and so every time we go to watch a movie or load it up, there you are playing in a tiny preview and my kids always ask who that is:) in a little loop. VTS better than any kids tv shows, ha.